More and more people are talking about and participating in CrossFit; you probably have friends who are doing it and maybe you have considered trying it but are not totally sure what CrossFit entails. This article will break down what CrossFit is and how to make sure you don't sustain an injury while trying to get in shape! CrossFit is a high intensity training regimen that is characterized by workouts that are short, intense, and constantly varied. Several slightly elevated risks for injury have been reported in relation to CrossFit exercises, but applying proper strength training and conditioning principles as well as maintaining good form can reduce the risk of injury and help CrossFit enthusiasts remain active and healthy. CrossFit is a full-body, strength and conditioning program that combines core training, weight lifting, cardio, gymnastics and several additional elements in order to maximize the body's physical potential as well as improve muscle tone and overall body composition. CrossFit is different from conventional workout programs because it also focuses on other aspects of health which include: establishing proper dietary habits, developing heightened power levels, cross-training in multiple domains, and enhancing biological processes such as muscle memory. An additional aspect of the CrossFit regimen is metabolic conditioning, which refers to high intensity circuit-type training that aims at maximizing the body's physical capacity by improving its response to challenging tasks. In particular, conditioning routines are intended to enhance the way the body stores and utilizes energy during strenuous activities. 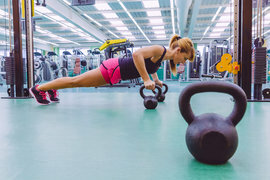 This high-intensity activity is linked to an increased risk of injury and research suggests that CrossFit has a similar risk level as powerlifting and competitive weightlifting. However, the same type of research has demonstrated that CrossFit has a 10 times lower risk of injury than recreational running. Therefore, as with any activity it is important to use strategies that prevent injuries, such as learning about body mechanics, before you begin to participate in CrossFit training. CrossFit beginners are often encouraged to take introductory classes, which demonstrate foundational movements and the proper form for each of the CrossFit activities that will be performed. One of the main reasons that CrossFit enthusiasts sustain injuries is due to the improper execution of certain exercises. Furthermore, experts in back injury treatment have indicated that Olympic lifting, one of the major components of CrossFit, can result in spinal disc injury and spinal bone fractures for athletes who do not have the proper strength and conditioning routine. Therefore, attending introductory sessions, as well as steadily incorporating and increasing the strength training and conditioning program that is designed for CrossFit exercises, will dramatically reduce the risk of becoming injured. In particular, CrossFit athletes must learn how to consistently use the proper form and build muscle memory as these are key factors that promote enhanced performance and decrease the occurrence of serious injuries. Any form of pain that occurs during, immediately after, or even a few days following a CrossFit activity indicates that the exercise was not executed properly. When this happens, it is important to temporarily rest the injured area by avoiding aggravating activities. Bridgetown Physical Therapy & Training Studio conduct comprehensive assessments that help CrossFitters understand how their posture, form, and execution techniques may have contributed to their injury or discomfort. They assess what movements a client will be doing during a CrossFit activity and demonstrate what safe technique looks like. This helps ensure that the individual will not suffer from the same type of accident or injury again. Furthermore, the frequency and intensity of a client's Crossfit routine is evaluated as these are factors that may also need to be adjusted in order to improve the client's recovery and future experience with CrossFit. Our Physical Therapists are dedicated to developing smart programming that takes each client's particular training regimen into consideration. Our team of experts use the assessment results to design a program that is tailored to a client's needs in order to help improve back pain that may be the result of poor posture, to restore a full range of motion, and to ensure that the same type of injury does not happen again. Strength and conditioning is an essential aspect of Crossfit training that the Physical Therapists at Bridgetown Physical Therapy & Training Studio can also help you focus on improving so that you can enjoy this high-intensity sport and experience the health benefits, such as improved body composition, without being interrupted by an unnecessary injury. Call Bridgetown Physical Therapy & Training Studio to learn more about how our services can greatly benefit you. 1. Bellar D, Hatchett A, Judge LW, Breaux ME, Marcus L. The relationship of aerobic capacity, anaerobic peak power and experience to performance in CrossFit exercise. Biol Sport. 2015; 32(4):315-20. 2. Hak PT, Hodzovic E, Hickey B. The nature and prevalence of injury during CrossFit training. J Strength Cond Res. 2013; in press. 3. Weisenthal BM, Beck CA, Maloney MD, DeHaven KE, Giordano BD. Injury Rate and Patterns Among CrossFit Athletes. Orthop J Sports Med. 2014; 2(4):2325967114531177. 4. Partridge JA, Knapp BA, Massengale BD. An investigation of motivational variables in CrossFit facilities. J Strength Cond Res. 2014; 28(6):1714-1721. 5. Smith MM, Sommer AJ, Starkoff BE, Devor ST. CrossFit -based high-intensity power training improves maximal aerobic fitness and body composition. J Strength Cond Res. 2013; 27(11):3159-72. 6. Murawska-Cialowicz E, Wojna J, Zuwala-Jagiello J. Crossfit training changes brain-derived neurotrophic factor and irisin levels at rest, after wingate and progressive tests, and improves aerobic capacity and body composition of young physically active men and women. J Physiol Pharmacol. 2015; 66(6):811-21.